MPL announces a new UPS system for the PIP Family products, that can be operated from -40°C up to +60°C environmental temperature (*without charging up to +75°C). The system called BOLERO is a Brown Out and Load Dump protection for Extended Reliability Operation. 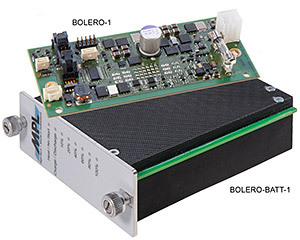 The BOLERO is designed to protect the rugged MPL embedded computer (PIP Family) from various input voltage failures. This includes reverse polarity, over-voltage, load dump effects, and brown out (under voltage and power loss) failures. The system consists of the BOLERO-1 and the BOLERO-BATT-1. The BOLERO-1 is responsible for detecting input voltage failures and switching to the battery, charging the battery, and communicate with the host system. It consist of a load dump and polarity protection, a battery charger and a CPU which controls the charger, the heater, and the state of the battery pack. The BOLERO-BATT-1 is the battery pack, designed with a fuel gauge and a balancing & protecting circuit. The battery is equipped with a heat foil to extend the operating temperature down to -40°C. The fuel gauge is giving accurate information about the battery's state of charge. This information is not only available to the operating system, it is also visible via LEDs on the battery pack front. The protective circuit prevents the battery pack from overcharging, deep discharge, over current on charge and discharge, and short circuit. It incorporates a cell balancing device which controls and equalizes the voltage of each cell. • Reverse polarity protection up to -36V. • Load dump protection up to 150V. • 10Wh brown out protection. • State of Charge LEDs. • Operating temperature range from -40°C to +60°C (*without charging up to +75°C). • Inhibits system start when back-up time to short (configurable). The output power of the BOLERO solution is 10Wh, which is sufficient for 30 min. autonomy with an average PIP power consumption of 20Watt, or 15 min. with 40Watt. The perfect solution for any PIP currently available.